With the emergence of electrified transit options and intelligent transportation system technologies, what are the costs, benefits, and barriers associated with these technologies that local governments, utilities, and transit agencies must consider and address? What best practices can be identified from electric mass transit and smart mobility case studies, and what can be done at the local, state, and federal levels to provide forward momentum in these areas? Are the visions of future transportation systems realistic and obtainable? This event is free, and lunch will be provided on both days. An evening networking reception will also be planned. This event is sponsored by UT, TDEC, and TVA. If you have any questions, please contact TDEC OEP’s Communications Coordinator Shauna Basques at Shauna.Basques@tn.gov or 615-253-1947. About a dozen representatives of a European Union (EU) delegation focused on energy finish a three-day educational trip to East Tennessee with two meetings today. They will be the program for the weekly meeting of the East Tennessee Economic Council this morning in Oak Ridge. After that presentation, they will finish the series of meetings with discussions at the University of Tennessee. The group was in Chattanooga yesterday. 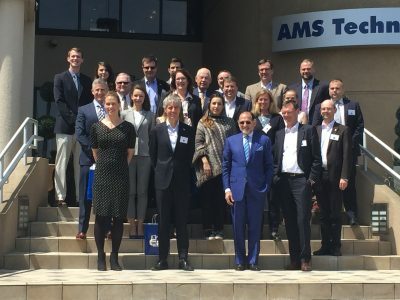 On Wednesday, they visited Oak Ridge National Laboratory after being hosted by Nazzy and Hash Hashemian of Analysis and Measurement Systems Corporation (AMS) at a luncheon in Knoxville arranged by the Tennessee Advanced Energy Business Council (TAEBC). The discussion included members of the TAEBC and the EU delegation. This is a photo of the attendees at the event. Pilot locations for the City of Knoxville’s new LED streetlights are up and running. The pilot locations have been serving as testbeds to be evaluated by the City, public stakeholders, and for residents to also get the chance to experience the new LEDs in action. 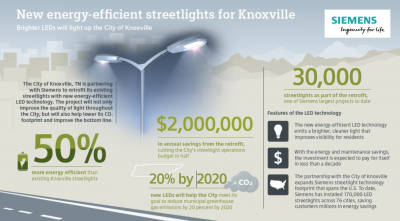 Since late last year, Knoxville has been gradually flipping the switch to energy-efficient lighting in several neighborhoods through these design and testing phases. 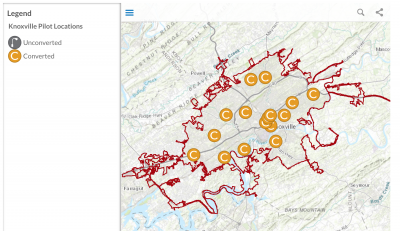 An interactive map on the City of Knoxville Office of Sustainability’s website shows select testbed areas where some of those high pressure sodium (HPS) bulbs have been converted to LEDs so far, from Western Avenue to parts of Chilhowee Drive. According to the map, 16 locations in Knoxville have been tested out. You may remember Knoxville chose Siemens to retrofit its nearly 30,000 streetlights in September 2017. The retrofit will cut the City’s streetlight operation budget in half by $2 million annually in energy and maintenance costs. With these savings, the investment is expected to pay for itself in less than ten years. Once the design and testing phase is complete, Siemens expects to begin installation of the new lights across the city later this year. All work is expected to wrap up by Summer 2019. For more detailed information about this project, click here.